February 28, 2017 Robert W.
Fast ASD Convention Signs are available for the upcoming ASD Convention in Las Vegas March 19th – 22nd at the Las Vegas Convention Center, 3150 Paradise Rd. Las Vegas, Nevada 89109. The ASD Convention will be attracting 45,000 buyers from 88 countries for retail and wholesale merchandise. It is the Grand Daddy of retail and wholesale merchandising with buying to be estimated for over 2 billion dollars from this show alone. Many of the vendors that come to Las Vegas to sell their wholesale goods to the thousands of buyers will need last minute graphics for many different reasons. Sometimes, the graphics are simply forgotten back home in the rush and excitement of coming to Las Vegas, other times the graphics are shipped to the wrong location. In either case, rest assured that Las Vegas has many sign shops wanting to assist you in having your graphics ready. Las Vegas is full of sign and banner shops that cater to the large convention industry. Fast ASD Convention Signs is no problem in the Las Vegas area. In fact, there are several sign shops located near the Las Vegas Convention Center that offer drop off service and I understand that Lyft or Uber also will pick up and deliver graphics as part of their ride sharing program for a small fee. Fast ASD Convention Signs does not equate to high price. State of the art sign shops in Las Vegas have new large format printers that are capable of producing banners and signs in minutes with excellent quality. Unless production schedules have to be changed, there should be no additional charge for same day service. Checking with Google Business Reviews or Yelp will allow you to check the reputation of the sign and banner shop you are thinking about using. Then you are just a telephone call away from getting your rush order signs in time for the ASD Convention. February 27, 2017 Robert W.
Same Day Conexpo signs and banners are a possibility in Las Vegas. There are many sign and banner shops that want your business and are willing to go the extra mile to make you happy and provide you quality service at a fair price. Since Las Vegas is the capital of the convention shows, sign shops want repeat business and will bend over backwards to provide you great service. Same day Conexpo signs and banners are sometimes necessary because signs are discovered damaged upon arrival to Las Vegas or simply forgotten back home. In these cases, same day graphics are needed to replace the damaged or missing graphics because the convention is not going to be postponed. The thing to do in these cases is to get your design file of your graphics and give it to one of the many sign shops in Las Vegas that cater to the convention industry so they can use it to print your new graphic. While you might think that same day signs and banners are expensive, this is not usually the case. Large format printers print signs and banners at amazing speeds and the cost of making a sign is lower than ever before because of the printing automation. In some cases where sign production has to be rescheduled to accommodate your rush order print and overtime needs to be paid to complete scheduled work in a timely manner, there may be a upcharge in the price of the sign. Also, many sign shops offer delivery service and companies like Uber and Lyft offer pick up and delivery of merchandise as well at very low costs. Same day Conexpo signs and banners are available at the sign and banner shops in the Las Vegas area. Simply do a internet search for a sign shop near your location. February 26, 2017 Robert W.
Sign printing near the Las Vegas Convention Center allows for signs and banners to be printed very quickly. Not only do sign shops in the area have the ability to print quick signs, they are close by and the signs can either be delivered or picked up in short time. Also, companies like Uber and Lyft now offer the convenience pick up service if requested. Sign printing near the Las Vegas Convention Center is for companies that need replacement signs and banners in a hurry because of a variety of circumstances. It could be as simple as forgetting your graphics back home or maybe the shipping company you relied upon to deliver your graphics failed and delivered them to another location in a different state. These things happen all the time and fortunately, Las Vegas has sign and banner shops that can replace your graphics fast. The invention of the large format printer has updated the sign industry tremendously. These large printers can print at very fast speeds ( up to a few hundred square feet per hour) and have the ability to print vinyl banners as well as more detailed signs that require finer print like poster boards and posters. The quality of sign making has improved and has also driven down the cost due to the manpower actor required to produce signs. Instead of the signs being labor intensive, modern technology produces them faster and cheaper. In addition, the quality of the printing inks are now environmentally friendly and produce better quality signs. Sign printing near the Las Vegas Convention Center can be found by searching the term on your smart cell phone or tablet. Simply use the search term “ sign printing near me” and that will lead you to many different sign and banner shop choices in the search results. February 25, 2017 Robert W.
Discount Conexpo Sign and Banner printing is available for the Conexpo Convention being held March 7th – March 11 at the Las Vegas Convention Center, 3150 Paradise Rd. Las Vegas Nevada 89109. The Conexpo convention is a very large convention with thousands of vendors and hundreds of thousands of people in the construction industry attending. There will be many seminars about new products that are revolutionizing the industry , as well as seminars and meetings about changing requirements to keep everybody on top of the legal and technical changes in the industries. There are hundreds of conventions and trade shows held in the Las Vegas area every year as Las Vegas is the number one destination in the world to hold conventions and trade shows. With year round good weather conditions, people love escaping the cold during the winter months and enjoy the moderate weather that allows for outdoor activities year round in Las Vegas. In addition, there are so many activities in Vegas to do, such as gambling, entertainment, golf, fine dining, etc. Because there are so many conventions and meetings held in Las Vegas, there are many sign shops that compete for the right to print your banners and signs. This competition fosters the competitive spirit America was built on and sign shops offer all sorts of printing specials for your graphic needs for the conventions. There are several sign and banner shops very close to the Las Vegas Convention corridor that offer fast and dependable sign printing services at fantastic prices. Discount Conexpo sign and banner printing can be found by simply searching for sign shops on your smart phone or on the internet. Also, by using tools such as Yelp and Google business reviews, you can learn a great deal of information about the different shops before even giving a sign shop a call. Discount ASD Convention Las Vegas printing is very important to the thousands of people that attend the ASD show in Las Vegas. This year, the convention is being held at the Westgate Hotel, 3000 Paradise Rd, Las Vegas Nevada, 89109 on March 19th – March 22nd. More than 45,000 people are expected to show up at the ASD Convention from 88 countries. It is one of the largest retail trade conventions in the world. It allows retailers and wholesalers to get together and learn about the various products being offered worldwide. Discount ASD Convention Las Vegas printing allows for these companies to get quality printing for signs and banners in Las Vegas at very reasonable prices. There are many sign and banner shops local to the Westgate that will offer discount printing because of the competitive sign market. One of the favorite signs at the ASD convention is the retractable banner stand. These banner stands are lightweight and very portable which allows them to be set up in a hurry and moved around. They can be used over and over again at various shows and they can also be placed next to each other so as to look like a single large graphic. Three of these banner stands placed together almost allows for a 6ft. high by 10ft long graphic which looks very impressive. These retractable banner stands come in a variety of sizes to accommodate most display graphic needs. Other popular graphics at the ASD convention include the vinyl banner and foam core board signs. These are relatively inexpensive props that help visually reinforce the items you are trying to market. people like to see what the item looks like and many items can be printed on a foam core board and banner. Discount ASD Convention Las Vegas printing is available at many different locations in the Las Vegas area. February 24, 2017 Robert W.
Conexpo signs and banners are available in short notice in Las Vegas. Conexpo is the largest construction industry convention in the world. This years Conexpo in Las Vegas will have over 2500 vendors and over 2,500,000 square feet of floor space for display. Every major component of the construction industry will have representatives there. This years Conexpo will be held March7th to March 11th. There will be many signs and banners needed for the Conexpo convention. Stand up banner stands are one of the most popular graphic displays that will be on display at the show. These portable banner stands can be used repeatedly and are easy to travel with and can be set up in just a few minutes. They come with a conveniently carrying case, are lightweight and are considered a relatively inexpensive graphic display that looks professional, but yet moderately priced. Many times people will place these banner stands side by side so as to give the illusion of being one graphic. Just 3 of these banner stands side by side creates almost a 10ft wall in length by about 6 feet tall for an impressive look. Conexpo signs and banners also includes the easiest and cheapest graphics, the vinyl banner. These vinyl banners come in a variety of sizes to accommodate the vendor. Many vendors use them as backdrops to there display booths or nag them high in the air so that they can be noticed by everyone at the convention. These vinyl banners are printed with large printers that have become a main tool in the sign makers arsenal. Bright and vivid colors allow for all sorts of images to be printed on the banners with amazing quality. Conexpo signs and banners can be found at the sign and banner shops in Las Vegas area at very good pricing. February 23, 2017 Robert W.
Fast overnight banners can get you that badly needed vinyl banner in a hurry. Las Vegas is full of sign shops that compete for your business and over fast turnaround times and low prices to get you to do business with them. The Las Vegas convention industry is huge and many times banners are needed very quickly because they get lost or are damaged while being transported to Las Vegas for the shows. Consequently, the vinyl banners need to be replaced, if this is the case, very quickly because they are not obviously going to postpone the convention show. Fast overnight banners are needed a lot by the convention industry in Las Vegas. The Las Vegas convention industry is the biggest in the United States for a variety of reasons. Las Vegas hosts some of the biggest hotels in the world, fine dining, entertainment, gambling and a whole lot of fun. People of the business industry like to come to Las Vegas for all of the above reasons and also because of golf. Las Vegas has many fine golf courses at reasonable rates and many times business is conducted over 18 holes. This is important, because most convention appear to happen during the winter months in Las Vegas, where the weather is moderate and the rest of the country is in freezing conditions. 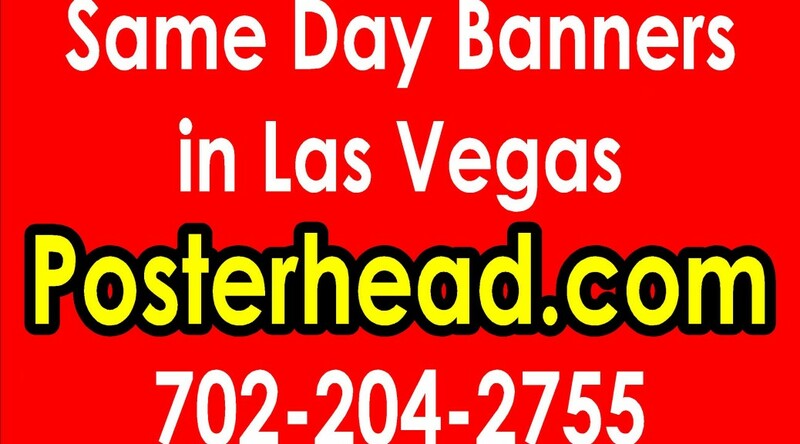 Fast overnight banners can be found at many of the top sign and banner shops in Las Vegas. A simple Googling or internet search for sign companies can lead you to the right sign shop. If you cross reference the sign shops with Yelp or Google business reviews, you can learn about the reputation of the sign shops , pricing and their quality before even having to contact the shops. Fast overnight banners are easy to make and will not cost an arm and a leg. February 21, 2017 Robert W.
Same day signs for Las Vegas trade shows is very popular when you find yourself in Las Vegas at one of the many trade shows and discover that you don’t have your graphics. They could be lost , damaged or simply forgotten back home. A horrible feeling comes over you when you realize that after months of planning and huge economic costs, you do not have the necessary display graphics. What do you do ? Same day signs for Las Vegas trade shows are available in the Las Vegas area. Las Vegas is host to more trade shows than any other place in the world because Las Vegas has more hotel rooms and amenties that is offered to the trade shows than any other place. Also, the year round moderate climate offers an opportunity for people and businesses to get out of the cold weather in the winter months into a much more hospitable climate. Consequently, it is no wonder that everybody wants to come to Las Vegas to do business and have fun. There are many sign shops in Las Vegas with the necessary sign making equipment to make same day signs. One of the basic tools for sign making is a large format printer. The newer wide format printers utilize the 8 color ink system instead of the traditional 4 color ink system which allows for signs to be made with brighter and more vivid coloring than ever before. These wide format printers can print a few hundred feet of signage an hour in order to get your replacement signs in a hurry. ( It is best to have a print ready file to replace the graphics to expedite the time to make a rush order sign) Banner stands, vinyl signs, coroplast signs are just some of the signs that can be made in the same day. February 18, 2017 Robert W.
Nevada Fast Signs can get you that sign in a hurry. Many times people and businesses need Nevada fast signs for a variety of reasons. Because of all the casinos in Nevada and their requirement for signage, there are many sign and banner shops in the Great State of Nevada. Nevada fast signs can get you fast vinyl signs and vinyl banners in a hurry. This is especially important for unexpected events that come up that need signage to inform and direct people. Also, Nevada fast signs is important to the Las Vegas convention industry. People that are setting up display booths with their graphics often find a graphic missing or damaged that needs re[placing in a hurry. There is nothing more frustrating than planning for months for a convention and finding out you are without your visual media that you counted on as part of your presentation. Believe it or not, Las Vegas has many conventions and this is quite a common occurrence. Fortunately, there are many sign shops in the Convention corridor of Las Vegas that can help you make that replacement graphic the same day. Replacing the graphics does not need to cost an arm and a leg either. There is fierce competition among the many sign shops that try to offer better service and better quality than their competition. using Google business reviews or Yelp business reviews can help you locate the best and closest sign shop to assist you with your signage requirements. Local businesses in Las Vegas can use these same tools in locating cheap, but quality sign shops close to them as well. Contact a Nevada sign shop and see how they can make you fast signs that will increase your business and get you noticed. There is a saying in the sign business, “A business with no sign is a sign of no business”. February 17, 2017 Robert W.
Fast Las Vegas sign printing is imperative when you need signs and banners made quickly. There are many reasons for wanting fast signs such as having to replaced your lost signage or simply forgetting to order your signs to begin with. But whatever the reason, be assured that Las Vegas has many sign shops that are competing for your business. Many people coming to Las Vegas for conventions and meetings find themselves in need of last minute signs. Sometimes the graphics get lost while traveling to Las Vegas or other times they are simply forgotten back home and there is no time to ship them to Vegas in time. In these cases, the people call a local sign shop in Las Vegas and have their graphics replaced. Las Vegas is full of sign shops because of the amount of signage that is needed at the different convention venues. Millions of people visit annually Las Vegas for the conventions and Las Vegas is host to some of the biggest conventions in the world like Magic, CES, and other shows. Local businesses in Las Vegas need fast sign printing because circumstances require that different marketing strategies be used to reflect current market conditions. For example, If a store has a truck load of produce that needs to be sold, banners and signs in front of the store is a great way to advertise these products so that the local community is made aware of it and can take advantage of the fresh produce at a savings. Cafes and restaurants use banners to reflect sales on food that might otherwise spoil from being not eaten in a timely manner. 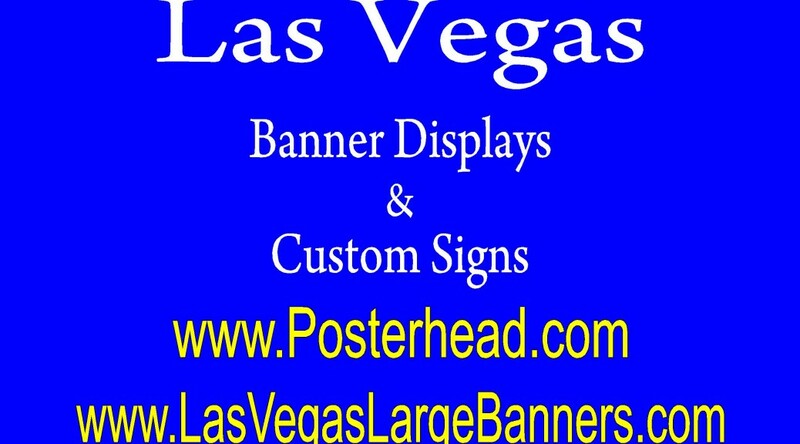 Fast Las Vegas sign printing is available in Las Vegas at any of the sign shops. Take advantage of these shops and shop around to get the best price available.